If you ask every person you see today–maybe even this week–if they’ve ever eaten sorghum, chances are good they’ll have no idea what you’re talking about. However, this grain is the fifth most important cereal crop in the world, largely because of its natural drought tolerance and versatility as food, feed and fuel. In many parts of Africa, people consume breakfast porridge made out of ground sorghum instead of the more commonly thought of maize porridge. In the United States, sorghum is used predominantly for livestock feed and in an increasing number of ethanol plants. Human consumption of this wholesome grain is on the rise, however, thanks in part to its gluten-free benefits. Rich in fiber, iron and protein, sorghum flour has proved to be effective in some gluten-free flour blends used to replace wheat flour in baked goods. But as I have found, it’s also rather tasty and quite versatile, whether gluten-free eating is a requirement or not. With its slightly nutty flavor and hearty, chewy texture, cooked sorghum grain can most similarly be compared to wheat berries. If you haven’t tried wheat berries, I would venture to say that if you like brown rice, you will enjoy sorghum. 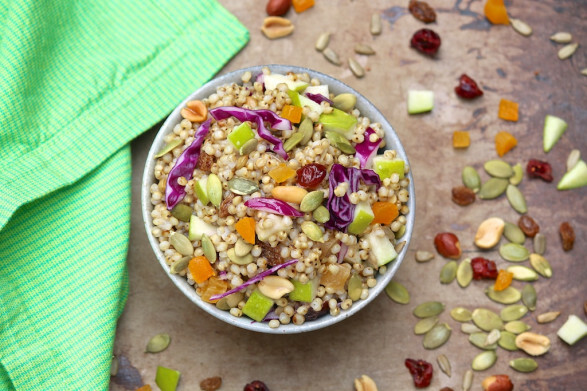 Beyond standing in for brown rice and wheat berries, sorghum grain can be used in place of grains like quinoa and couscous in your favorite salad recipes. Or try adding it to pilafs or green salads for extra texture, nutrients, and staying power. In soups, consider swapping out the noodles or white rice with this healthy option. Though sorghum takes 50-60 minutes to cook (place one cup of grain in 3 cups of water), once it simmers you can cover and largely ignore. After draining the residual water, use right away or cool, cover and refrigerate for use in the next four to five days. To introduce my kids to this somewhat obscure food, I let them taste the cooked grains prior to adding to a recipe. I explained that it was sort of like eating plain brown rice, but with a hint of crunch. This ancient grain–albeit new to many of us–wasn’t going to elicit the response of, say, a new cookie recipe, but I wanted them to see how basic and mild-tasting sorghum was before mixing it into a salad. I had a feeling they would like the unique texture…and they did. As a fun starting point, try popping the grains as you would regular popcorn. It’s a fun experiment, especially when you use a paper bag. 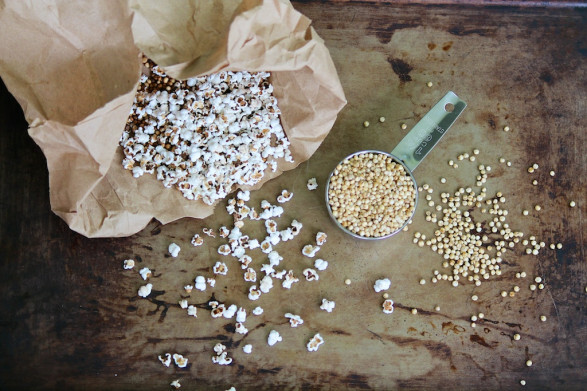 Popped sorghum can also be a fun option to croutons, adding crunch to salads and soups. When I first saw this idea, I had to try it just to see if it really worked. It really does work, and my popcorn-loving kids think it tastes just like “regular” popcorn. The kernels are simply smaller. Stove top method: Heat a stainless steel pot with a tight fitting lid over medium-high heat. When hot, add the sorghum grains and cover with a lid. Cook, shaking the pot often, until the sorghum grains begin to pop. Remove from the heat when there is more than a few seconds between pops. Season with toppings, as desired. 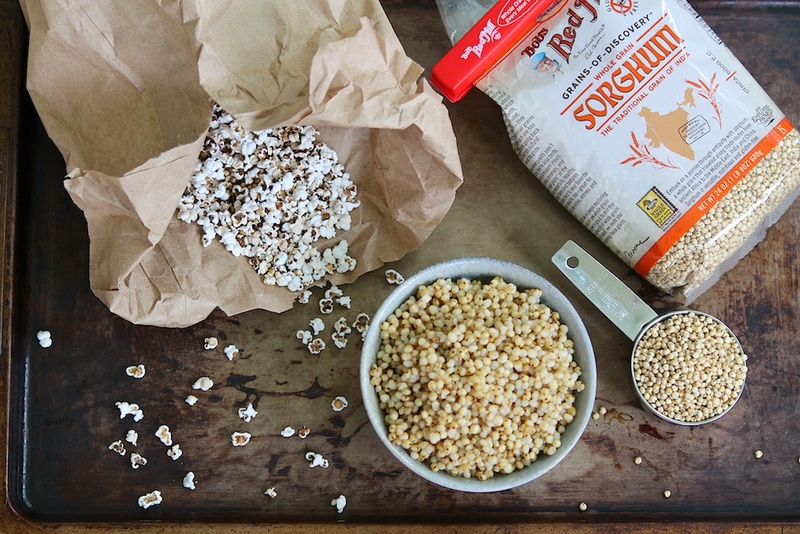 Microwave method: Place sorghum grains in a clean, lunch-size, brown paper bag. Fold the top down to close, and place the folded side down in microwave. Heat on high for 2 – 3 minutes (varies depending on microwave’s strength; check a little early the first time so as not to burn). Remove from the microwave when there is more than a few seconds between pops. Season with toppings as desired. This clever idea came from Bob’s Red Mill. They even have a Pinterest board full of tasty topping ideas. This is so cool! I wonder if it would give me less tummy troubles than corn?